Here the author doesn’t say “Clary knew” or “Clary thought”, just dives straight into the info. These are clearly Clary’s thoughts and opinions, though. She’s the driving voice of the narrative–and this passage is filled with her voice. VOICE reminds readers who’s telling the story. 3. Paint a word picture. Thoughts don’t always come to people as fully formed sentences. They may be purely visual, as in this example. The words on the page aren’t Clary’s word-for-word thoughts, but a description of her wordless memory. This technique is especially fitting for Clary, an artist whose journal is filled with sketches. A musician’s thoughts might have a musical accompaniment. A soldier’s thoughts might include the throbbing backbeat of mortar shells. The sense of smell is linked to memory, so a particular scent might trigger powerful images and memories. Sensory images are a powerful tool to help you show characters’ deepest thoughts, feelings, and memories. 4. Write thoughts as pseudo-dialog. Okay, she told herself. Everything’s fine.”–City of Bones, by Cassandra Clare. Notice that although Clary’s thoughts are written similarly to dialog, the author omits quotes. The lack of quotation marks makes it clear that she isn’t speaking aloud–we are hearing Clary’s unspoken thoughts. Authors sometimes denote thoughts with italics, but it’s a technique best used sparingly. I love the examples above because in every instance, Cassandra Clare uses Clary’s thoughts to accomplish multiple purposes. In the first, she paints a picture of Clary’s memory while simultaneously doling out important plot information. In the second and third, she breaks up the narrative with a bit of humor while showing Clary’s attitude toward her friend Simon. In the last, we see Clary trying to reassure herself. In context, though, her thought only heightens the tension. 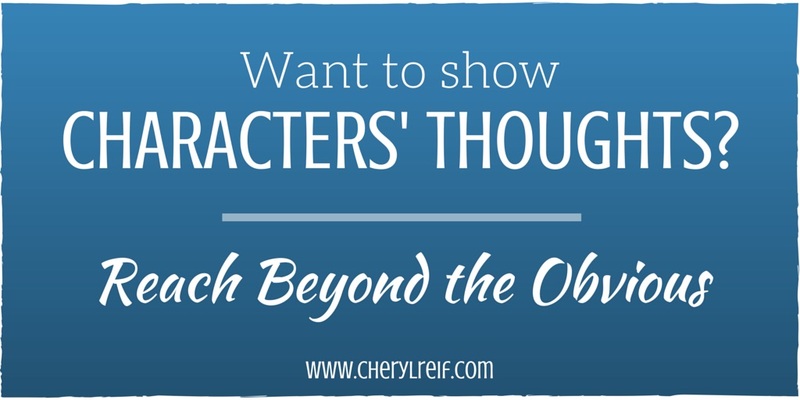 Showing a character’s unspoken thoughts lets you reveal her unspoken secrets, reveal blind spots, dig into motivations, and more. It’s also a great way to make your character more sympathetic to the reader. Do you have questions about writing? Let me know! I love answering your questions!